According to a recent UNEP report, of the 3000+ Clean Development Mechanism (CDM) projects in the pipeline as of May 2008, only 6 projects dealt with energy efficiency! This is a real shame, because buildings are both the largest and cheapest source of reductions of carbon emissions. We need to focus on building energy efficiency now, especially as China continues to build new real estate, because the long life of buildings means that decisions made today will affect carbon emissions for the next 50 years. Hopefully negotiations for the post-Kyoto successor will result in a more effective CDM that funnels investment to the vast, cheap sources of carbon emission reductions in the built environment. 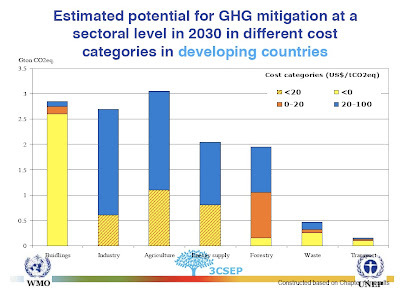 As shown in the chart below, the potential for GHG mitigation through building energy efficiency is both massive and low-cost. To put this 2.5 gigatons of carbon saving potential from buildings in the developing world into perspective, this is more than China's ENTIRE EMISSIONS of carbon in 2006, which were a "mere" 1.48 gigatons. But a look around almost any construction site in Beijing should make it clear that many of these GHG reduction measures are not being implemented, even though the CDM could theoretically be used to help fund the investment. So what are the barriers to using the CDM for building energy efficiency? 1) The benefits of the CDM credits are outweighed by the transaction cost of applying for the CDM credits. Since building energy efficiency projects are generally small and use a variety of technologies in tandem, they are not well-suited to the CDM process. The CDM methodologies would require validation of every single technology in every single building, a time- and capital- consuming process that reduces incentives to go through the CDM process. 2) The lack of reference cases. 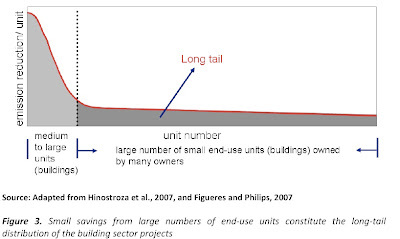 Especially for new construction, how can we know say how much energy the building saved? What is the proper baseline building for comparison? The existing CDM methodology is unclear on this point. 3) Additionality. In many of these cases, the overall economics work without credits, and the only thing holding the project back is a misalignment of incentives thanks to the fragmented building market. It's not clear to me that just throwing money at this situation in the form of carbon credits is the answer, but I'm not sure. It probably would help some buildings make extra steps toward building efficiency, but might be spent more effectively elsewhere. The additionality issues are also very much still a work in progress at the UN review process, creating uncertainty and discouraging building projects from applying for credits. 1) Adopt more statistical management tools to measure reductions- i.e. increase sampling. If we submitted a 1000-building project for CDM verification, we shouldn't have to submit every building for verification, just a sufficient number to reasonably estimate the reductions. 2) Allow performance based methodologies- i.e. instead of measuring every technology's individual contribution to carbon reductions, measure the overall effect by measuring energy use per area and comparing it to other baseline projects to determine carbon savings. 3) Establish common performance baselines- i.e. allow each region to create a baseline for buildings based on property type, energy source, and climate zone. How can we use the CDM to drive higher energy efficiency standards for buildings? The UNEP report also suggested an innovative approach to using the CDM to help countries reach higher building energy performance standards. The idea is this: Let's assume the government of a developing country wants to raise building code energy standards over time. The government then establishes a new performance-based code that gets progressively more stringent over time. The CDM methodology could then establish a crediting baseline to help building owners deal with the burden of getting to the new, more stringent standard. Building owners would have to get over a minimum hurdle, called the crediting baseline, and would earn credits for any reductions between the crediting baseline and the sector standard. But there would also be a kicker- for any reductions over the sector standard, buildings would earn more valuable, "premium" credits, thereby providing incentive for using innovation to go beyond the sector standard. This is a nice approach, because it places responsibility on the developing countries and their building owners to improve energy performance, but provides ample help in the form of CDM funds and does not require mandatory caps on overall carbon emissions. 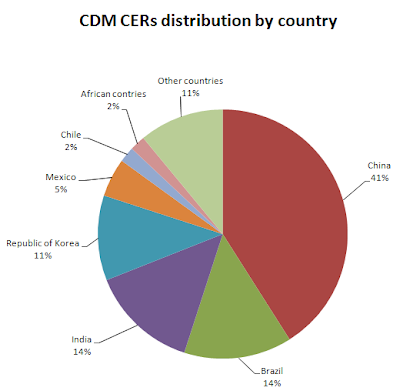 As we can see in the chart above, China is far and away the largest CDM market. More importantly, it is also the fastest-growing big real estate market. There is a huge opportunity for a better CDM methodology to help fund building energy efficiency in China. this could be a great mechanism for China to finally get serious about making sure all buildings comply with energy standards. Try check out Project 2 degree which is being co-developed by the Clinton Climate Initiative. It just a thought that maybe cities that are involved at some point in time may claim credits. By the way I am also working on how to green builidngs in China and find your page very interesting. Thanks for sharing information.China has start project related Clean development mechanism ignoring cheapest source of carbon reduction building energy efficiency.I think its a good decision taken by China . This project helps to sort out this serious problem about usage of renewable energy & sudden climate change due to global warming.